Heat oven to 400°F. Line 15x10x1-inch pan with foil; spray foil with cooking spray. In shallow bowl, mix crushed chips, oregano, paprika, thyme, seasoned salt, garlic powder and red pepper. In another shallow bowl, beat egg and milk. Coat chicken pieces lightly with egg mixture, then coat lightly with crumb mixture. Place in pan, skin sides up. Sprinkle with any remaining crumb mixture. Drizzle with melted butter. Bake uncovered 50 to 60 minutes or until juice of chicken is clear when thickest piece is cut to bone (170°F for breasts; 180°F for thighs and legs). 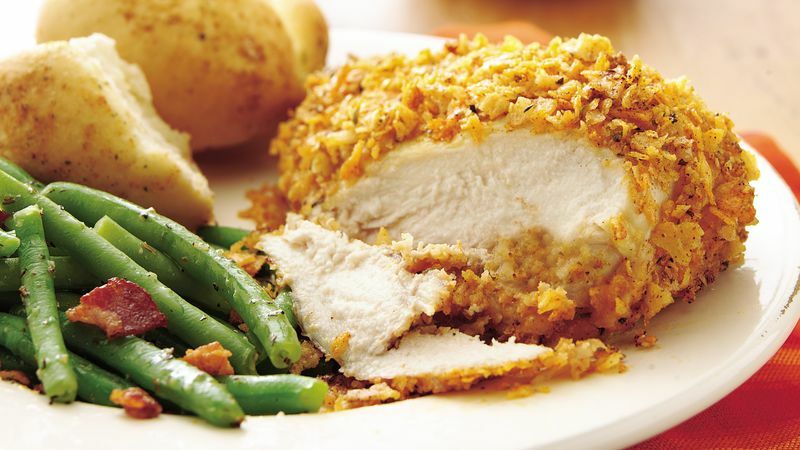 If your family likes white meat, go ahead and substitute 4 chicken breast halves for the cut-up whole chicken.